Melanoma is a cancer of the skin pigment cells. Like other skin cancers their risk of occurrence is related to sun exposure and light complexions. Although melanoma represents a small portion of all skin cancers, it is responsible for the majority of skin cancer–related deaths. Melanomas have a vertical and horizontal growth phase. During the horizontal phase there can be skip areas leaving unaffected areas between affected cells or satellite cells that are not visible to the naked eye. Once they grow vertically they travel through the lymphatic system into the bloodstream and distant places like the lungs and brain. The treatment and diagnosis is predicated on a biopsy showing the cancer cells, the depth of their penetration and the presence or absence of enlarged palpable lymph nodes draining the area of the melanoma. For the arms this would be the armpits. All of them require surgery. The depth and presence of nodes govern the margins required around the excisions and whether or not lymph node sampling and imaging studies are needed for staging. Once staging is performed a specific treatment protocol can be applied. Some melanomas, specifically lentigo maligna melanoma, can stay stuck in a horizontal growth phase for years. They are described as being in situ and are curative by surgery. The main issues with melanomas are removing the cancer as well as any surrounding satellite cells and closing the resulting defect leaving minimal disfigurement. Leaving satellite cells behind will eventually result in an recurrence and possible early death. This photo shows a lentigo maligna melanoma of the nose and the surrounding area of excision required to ensure any satellite cells are removed a the time of surgery. This was closed with a rotating flap from the side of the nose. This photo shows a lentigo maligna melanoma of the cheek with the margins required to ensure removal of surrounding satellite cells. The margin was sampled first for biopsy. The square is then removed and the cheek/neck flap required for closure is shown. 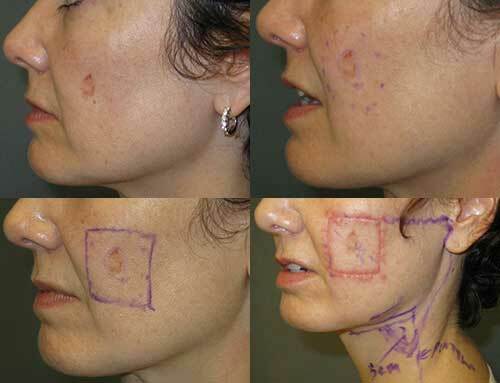 The treatment is routinely surgical with chemotherapy and immunotherapy as needed. The treatment protocols have improved significantly so the fatality rate is lower than it has been in the past. There are anecdotal reports of topical Imiquimod effectively treating lentigo maligna melanoma without surgery. The long term efficacy of this is unclear especially since satellite cells, not visible to the naked eye, can easily be missed during the application of the medication. Recurrent cancers are more aggressive & harder to cure. The recurrence rate is dependent on the entire removal of the cancer (proven by microscopic examination of the excised specimen) and satellite cells as well as the response to chemo/immuno therapy. However, once you have had one you are obviously at greater risk of getting another anywhere you have skin than someone who has never had melanoma. Chemotherapy and immunotherapy are associated with numerous adverse reactions include hair loss, nausea, vomiting, anemia, weakness, lethargy etc. The benefits of early treatment are prolongation of life. The recovery is dependent on the surgery and treatment protocol employed, if any. 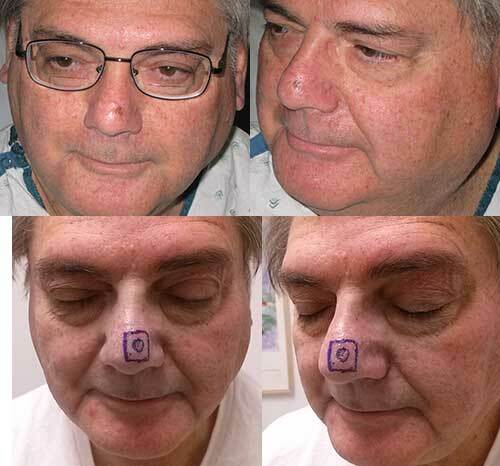 For skin graft closure there is generally 2 weeks of immobilization of the treated area. For flaps there may or may not be any immobilization. Regardless of the surgery most patients are back to their usually life in 2 to 3 weeks especially if treated early. These recovery periods can be severely lengthened by responses to chemotherapy or immunotherapy.